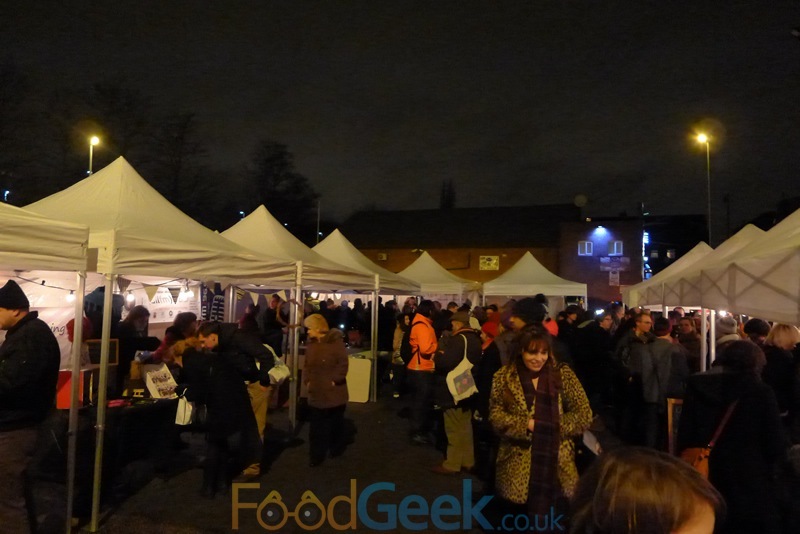 A cold, dark train station car park in Levenshulme might not seem the most obvious place for a Christmas party but last week the final Levy Market of 2013 was just that. Moved from it’s regular morning slot on the last Saturday of each month to Friday night so that visitors could finish their shopping whilst getting into the Christmas spirit. With a real ale bar, stalls selling mulled wine and other warming, festive drinks as well as live entertainment there was plenty of Christmas cheer. 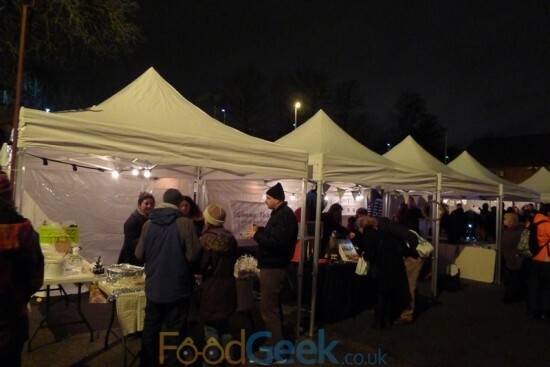 Having just enjoyed a calorific Mars Bar Eggnog and the Christmas Burger at SoLita we attempted to walk it off whilst browsing the various stalls. 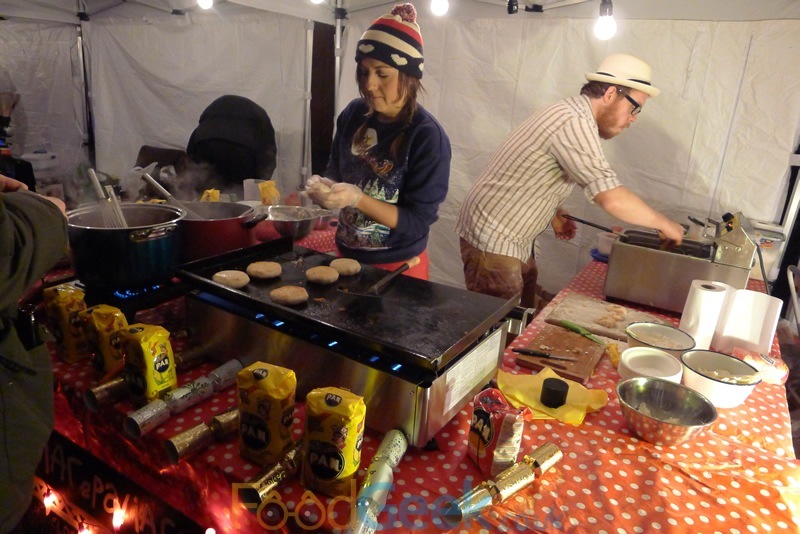 After a couple of drinks and purchasing some fabulous Christmas sausages from Bobby’s Bangers (Chestnut, cranberry & sprout) and festive beers from TicketyBrew we were ready to eat again. It’s rare to leave SoLita and not be completely stuffed but we’d purposefully left room for dessert, in the form of Columbian street food from Bailey & Jules’s ¡Arepa!¡Arepa!¡Arepa! stall. 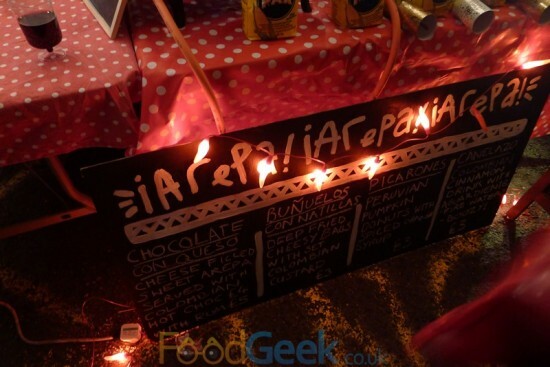 Their regular menu featuring savoury arepa based creations had been replaced with a special all-dessert selection. Naturally I tried all four items on offer. 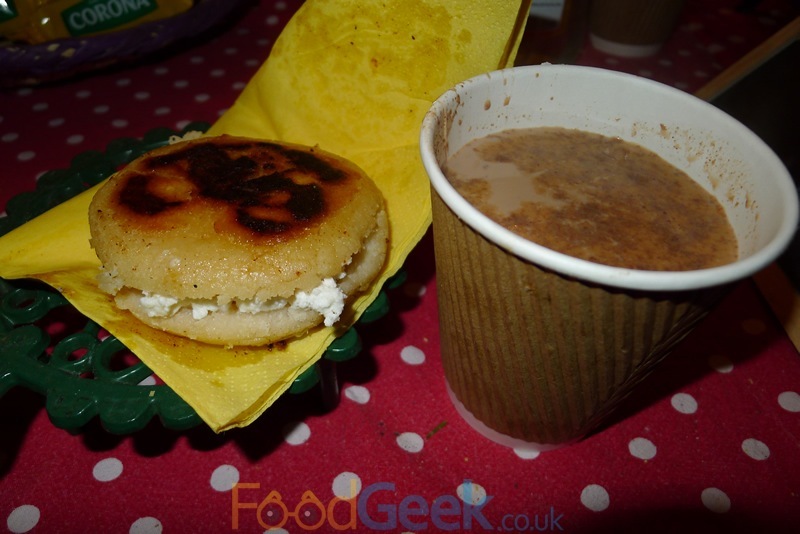 My favourite was ‘Chocolate Con Queso’, a cheese filled sweet arepa served with Columbian hot chocolate spiked with rum. The arepa wasn’t as sweet as i’d expected but was delicious dipped into the indulgent, sweet and boozy hot chocolate. 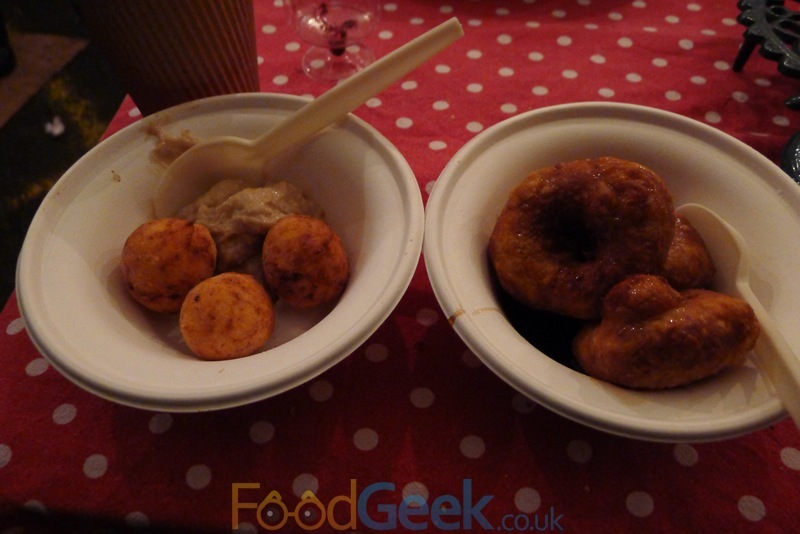 ‘Buñuelos Con Natillas’ are deep fried cheesy balls with set Colombian custard. I loved the fried balls and though the custard tasted good I found the texture and consistency a little odd. Not that it stopped me finishing it all though. Even better were the ‘Picarones’, Peruvian pumpkin donuts with orange syrup; the texture of the donuts was perfect, a super crisp exterior and light fluffy interior. The sticky, sweet & spicy sauce was lovely for dipping. Finally ‘Canelazo’ a hot alcoholic drink drunk by the inhabitants of the Andes mountains. Made with cinnamon, sugar and Aguardiente ‘fire water’. Jules warned that it’s very sweet and she wasn’t joking, I really enjoyed the main flavours but it was far too sweet for me. Nothing that a big squeeze of lime juice wouldn’t have fixed though and I know there were many people who loved it exactly how it was. I still happily finished it and it did a great job of warming us up but next time i’ll definitely ask for it with extra lime. Overall the switch to sweet dishes was a huge success and hopefully they’ll be back again in future maybe even alongside their savoury friends for a complete Columbian meal. Holding the market at night was a great idea too, despite the cold windy weather it was very busy with a fantastic atmosphere.